How much could you relate to this description for honey? - "Dark amber… it has hints of the woody forest with an underlying resinous taste but finishes warm and spicy." Hardly, if you think "Honey is honey, it's sweet and just that simple!" "Veiled in this fragile filigree of wax is the essence of sunshine, golden and limpid, tasting of grassy meadows, mountain wildflowers, lavishly blooming orange trees, or scrubby desert weeds. Honey, even more than wine, is a reflection of place. If the process of grape to glass is alchemy, then the trail from blossom to bottle is one of reflection. The nectar collected by the bee is the spirit and sap of the plant, its sweetest juice. Honey is the flower transmuted, its scent and beauty transformed into aroma and taste." 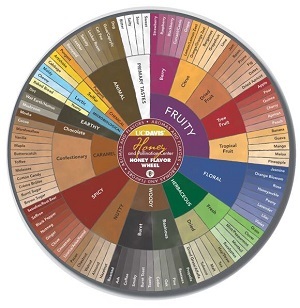 Now there is even an elaborate Honey Flavor Wheel (2014) invented by the Honey and Pollinator Center at the Robert Mondavi Institute that offers tasters a way to describe honey an describes the flavors and nuances of honey with references to almost 100 interesting descriptors that include hay/straw, tea, cheesy, butterscotch, confectionary, cotton candy, burnt sugar, burnt toast, dirt, baked bread, and even unsavory labels such as barnyard, dog and cat pee. Before you question or doubt the credibility of the Honey Flavor Wheel, it is reported that the production actually involved six months of research and development that brought together a group of 20 trained tasters, beekeepers, food enthusiasts and a sensory scientist. When tasting honey, with this huge lexicon to the tastes and aromas, it is no longer acceptable to say "it's sweet"! Honey has grown exponentially in its use with chefs, manufacturers and consumers over the years, especially with cakes and pastries. With consumers' preferences leaning towards natural and artisanal, honey has a huge potential as a premier ingredient in foods and beverages. Food producers are recognising the fantastic versatility of honey in combining with other foods, transforming flavor profiles and adding depth of character. Besides taste, honey has many functional benefits for both cooking and baking. It attracts and holds moisture, enhancing freshness and shelf life, and it acts as a binder and thickener for sauces, dressings and marinades. Honey also adds a rich golden or amber finish to recipes. 1. Hate the taste of honey? Don't give up, because there are too many floral varieties of honey to choose from: Taste Honey? No Way! End of 100 Interesting Ways to Describe the Taste of Honey. Back to "17 Honey FAQs [Frequently Asked Information About Honey]"